Start with a pumpkin that has no scratches or cuts to the skin. Any breaks in the skin will allow bacteria in to start the decomposition process. Avoid using pumpkins with any type of soft spot–these are ticking time bombs that will cause the whole pumpkin to go bad very quickly. Watch out for pumpkins with broken stems. While stems can easily break–a bunch of broken stems mean pumpkins that were handled roughly, often leading to other damage. If you are using pumpkins in indoor decorating, select pumpkins from farms that wash them prior to bringing them to market. 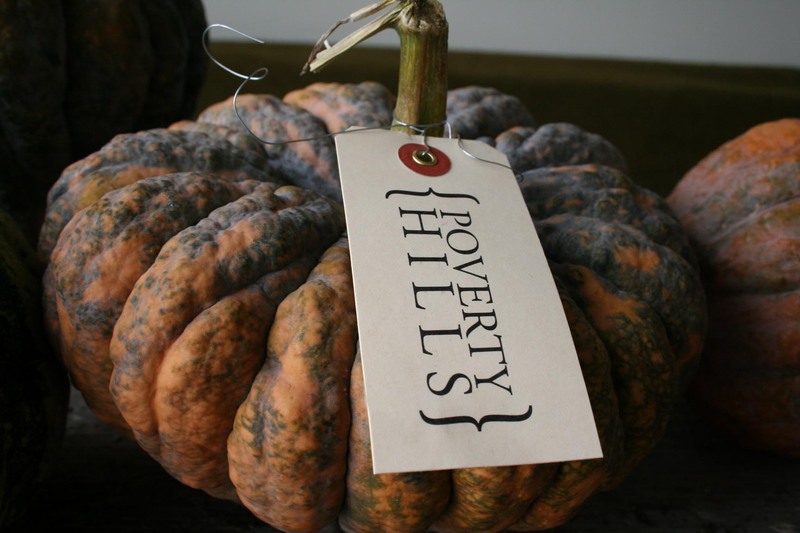 Poverty Hills wash and bleach all our pumpkins to remove the soil and bacteria from the farm which make them ready to go into your home. When using pumpkins to decorate in the house–be sure to set each pumpkin in a shallow container such as a glass pie plate. Even though most heirloom varieties are very long lasting, they are still a natural product that can go bad at any time despite the best of care. Your container can be disguised in your display with honeysuckle or grapevine tangles, straw, or moss. If you are using your pumpkin in outdoor displays, bring your pumpkins indoors when a frost is predicted. Protecting your pumpkins from freezing temperatures will prolong the shelf life. Using shellac or other clear spray on your pumpkins doesn’t allow the shell to breathe and will reduce the life of your pumpkin. Happy decorating! You are invited to post any of your fabulous fall decor pictures on our Facebook page here!